Lahaina’s modern name refers to “relentless sun,” making it renowned for its scenic beauty and temperate climate. Over the centuries, Lahaina has remained a prized jewel in the crown of Hawai‘i. In fact, it was the first capital of the Kingdom of Hawai‘i. The stage was set hundreds of years ago— Lahaina, abundant in freshwater streams, warm sunshine and fertile plains leading to its calm port, can be called the most historically significant spot in Hawai‘i. Lahaina’s origins go back to at least the 16th century when the powerful and prestigious Pi‘ilani dynasty ruled Maui from here. Its ancient name was Lele, describing “to leap or disembark” as from a canoe, because its tranquil shores offered a homecoming to weary travelers. Enrich your vacation by taking off on your own tour of Lahaina’s cultural sites. Discover a living history from the ancient days of Maui’s royal family; to the Kamehameha-united Kingdom of Hawai‘i and arrival of the missionaries in the early 1800s; to the robust whaling days of the mid-19th century, and multi-cultural immigrant landmarks of the early 20th century. Colorful maps can be found on various street corners that correspond to dozens of interpretive plaques, featuring the name of the trail and a breadfruit design at the top. When you come across these plaques, you’ll be able to read a brief story and see a photo or rendering of what the site may have looked like in generations past. Visit Lahaina’s first museum, the Baldwin Home. The white, two-story building was home to Dr. Dwight Baldwin, his wife Charlotte, and their six children, from 1836 to 1871. The family’s home, the stone Masters’ Reading Room, and their lush garden with shade trees provided refuge and hospitality to members of the Hawaiian royal court, American and British consuls, whaling ship captains and a neverending stream of travelers. Lahaina is considered a window to the world, as it has, for centuries, seen the comings and goings of chiefs and kings, missionaries and whalers, the military, heads of state, plantation owners, celebrities and explorers. Did you know that Hawai‘i’s first princess, Nahi‘ena‘ena, lived in Lahaina almost all her life, and had her own hale pili (thatched house) on the beach where King Kamehameha III Elementary School is situated today? Along the historic trail, you’ll learn that the majestic Banyan Tree, which is the most popular landmark on Maui, is well over 100 years old, has sixteen major trunks and spans a quarter mile in circumference. Between the banyan tree and the harbor stands the Lahaina Court & Custom House, which has served in an official capacity since 1860. It oversaw the change from Kingdom of Hawai‘i to government by the United States and was then used as a courtroom, police station and jail. Old Lahaina Courthouse now officially welcomes visitors to West Maui. From Canal Street (once a real waterway) to the lighthouse at Lahaina Harbor and around picturesque Pioneer Inn, find out how Lahaina’s rulers collided with the whalers in this busy seaport. Then continue north on Front Street to explore sites depicting the island’s plantation days. Among the earliest immigrants to Hawai‘i, the Chinese settled here just ten years after Capt. Cook discovered the islands. Their history in Lahaina includes helping to build a complex irrigation system throughout the West Maui mountains. The Wo Hing Society, a fraternal organization formed in 1909 as a chapter of the Chee Kung Tong, built the two-story Wo Hing Temple in 1912. Although it boasts an altar-shrine room on the second floor, the temple mostly served as a social meeting hall for the plantation workers until the1940s. Today, it is operated as a museum that offers respite from the busy commerce of Front Street. Outside in the yard is the Cookhouse, a Chinese community kitchen that was erected separately as a fire precaution. Don’t miss the tiny theater showing films of the Islands made by Thomas Edison in 1898 and 1906. Overlooking the seawall is the site of the old Liberty Restaurant, known for its homemade Fry Soup. Later this spot became the infamous Blue Max, a 1970s hot spot for such entertainers as Elton John, Linda Ronstadt, Boz Skaggs and Stevie Nicks. These days it’s home to Hawaiian music at Lahaina Pizza Co. Fish markets were a staple of Lahaina businesses over the years. At times, there were numerous fish markets within only a block of each other. Several of these markets were situated across from what is today Longhi’s on Front Street. 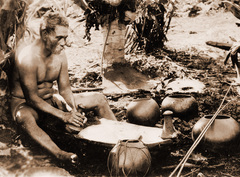 Local fishermen were the suppliers, and Lahaina families would buy the fish (like akule and opelu) to eat that night. Any leftover fish from the day’s business would be coated with a mixture of sugar, sesame seeds and soy sauce and dried for a snack. But changing times saw more lucrative job opportunities, and the small town fish markets gradually disappeared from Front Street. To find out even more about this fascinating town, take an interactive guided tour, which tells Lahaina’s stories through Hawaiian eyes, with Maui Nei Native Expeditions’ teachers and chanters. “A Journey Through Lahaina’s Past” is a perfect complement to the self-guided historic trail. Visit www.mauinei.com or call 808-661-9494.